Russian Defense Ministry Explained Syria’s “Land Area Issue” – Media 4.8 out of 5 based on 5 ratings. 5 user reviews. Russian Minister of Defense Sergey Shoygu said at the Association of Southeast Asian Nations meeting in October that more than 503 thousands square kilometers of Syrian territory were liberated from the militants. This number is nearly three times the official UN data one, which estimates Syria’s total land area to be 185 thousands square kilometers. 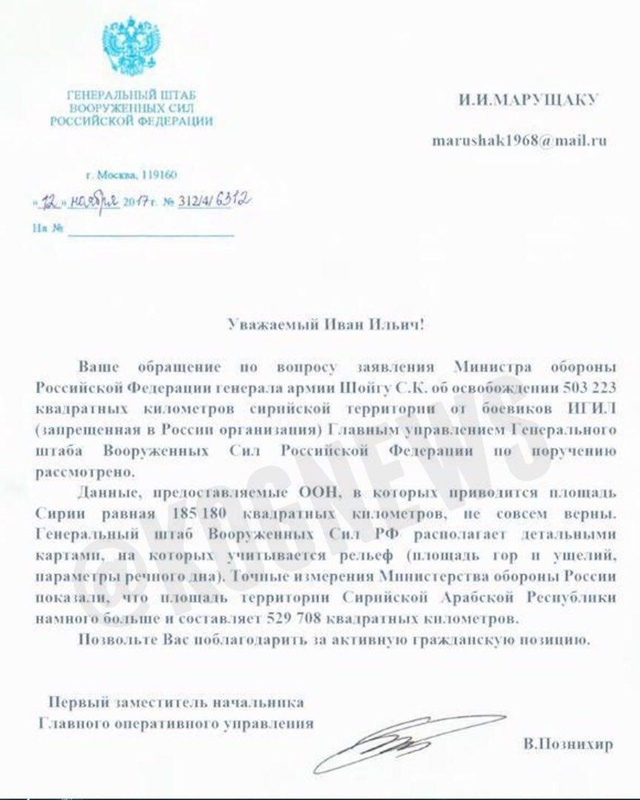 According to Govorit Moskva (Moscow speaks) radio station, reserve-officer training department chief of Moscow State Institute of International Relations Ivan Maruschak asked the General Staff of the Armed Forces of the Russian Federation to explain the discrepancy. In his interview to the radio station, he said he had received a response statement that called UN’s data “not entirely correct”. “The exact measurements by Russia’s Ministry of Defense show that the total land area of the Syrian Arab Republic is much larger and is 529,708 square kilometers,” the statement says. The Defense Ministry’s statement allegedly explained the discrepancy by saying that their data regarding total Syrian land area took the mountain and ravine reliefs with river bottoms into account. According to the ministry that explains why the Defense Minister did not make a mistake. As of now Govorit Moskva has taken down the report of the interview from their website. he drinks. look at his face. I don’t know about Shoygu but Putin drinks tea, how can one tell if someone drinks alcohol by looking at their face? It is not possible only a guess. Syrian Sovereignty no longer exists. So….Lebanon can forget having Sovereignty aswell. Israel confronted in UN to cease airspace violations…Putin/Lavrov push for that in the UN. And both Push in the UN for US, Israel and Turks to leave Syrian territory.